Last Sunday, I woke early and walked up the road from Spitalfields through the frost to arrive at the market at the usual time, but there was hardly anyone there. Wisely, most of the stallholders had stayed at home and the hardy souls who had arrived were still unpacking. It was cold and it was grim, so I simply returned home and went back to bed. This week, I returned an hour later and the picture was much the same but I resisted walking away because I felt a hunger for some new plant life. 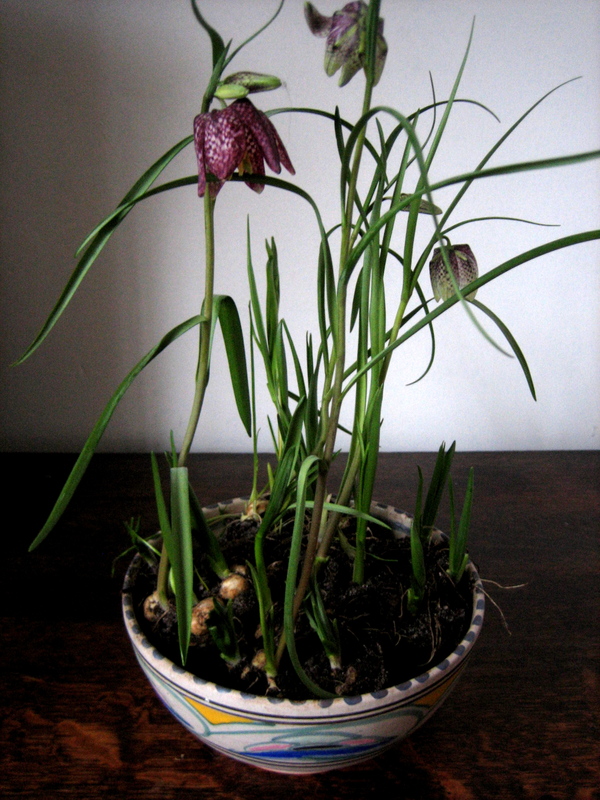 So I began searching through the trolleys of plants, stacked up in trays and when I tore away the plastic wrap, I found a tray of these Snake’s Head Lilies or Fritillaria meleagris at the bottom of a trolley. They were four pots for a fiver, so I handed over my cash and bagged the lilies. I have always been fascinated by these wonderfully strange plants with their spindly stems and exotic chequer board flowers in purple or white. They seem too exotic for England and yet there are places where they grow wild. I was once in Magdalen Meadow for a picnic, the island between tributaries of the river in Oxford that belongs to Magdalen College, and the entire meadow was full of Snake’s Head Lilies in flower. Having struggled to grow them in the past from bulbs, I was relieved to read Christopher Lloyd writing about the difficulties of cultivating them in “A Year at Great Dixter”. However, buying them in pots and then transplanting them is an effective subterfuge, and that is what I shall do with these – once I have enjoyed them indoors in this Honiton Pottery bowl of my grandmother’s and when the thaw has come. On the way home, I passed Gilbert & George in the Bethnal Green Rd, on their way to E.Pellicci for breakfast. They were all wrapped up against the cold in magnificently tailored full-length tweed coats and mufflers. George wore a flat cap and Gilbert had a pair of ear muffs. With my first discovery at Columbia Rd and my first sighting of G&G, I feel that the New Year has now begun in Spitalfields. I first saw these plants in the garden at Great Dixter in the late 70s when my new husband and I toured the area visiting various National Trust gardens and houses and generally gardens of interest. I love how delicate the flowers are , they seem to survive our climate pretty well. I too planted some in the Autumn but in a large pot near my front door. Wonder if they’ll survive this arctic weather and flower in the spring? Love them too. I hope they’ll bloom again in my garden soon. Perhaps in April? Currently everything is covered with snow but arctic wheather was never a problem. A german name is Schachbrettblume (chess board flower).